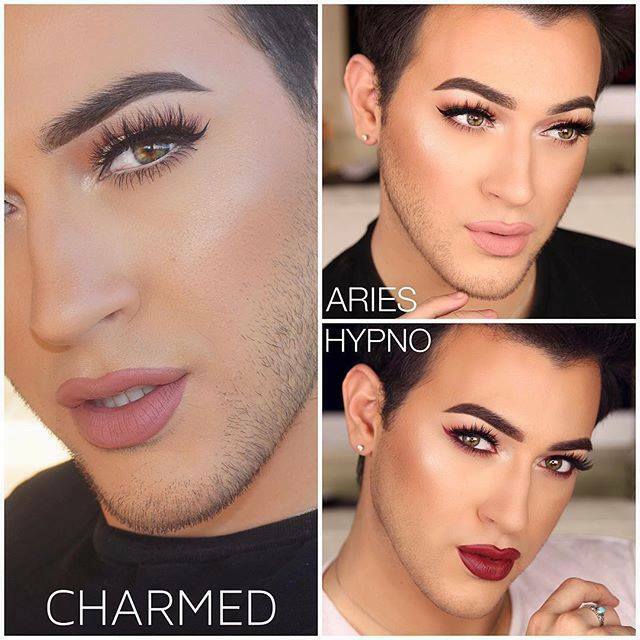 Behind Green Eyes: MannyMUAxOFRA - Aries & Charmed. Plus Boozyshop Service Review! MannyMUAxOFRA - Aries & Charmed. Plus Boozyshop Service Review! One Friday not too long ago, I was browsing kettle filters online (as you do) when I spotted an email from Boozyshop in my inbox. I had never bought from them before, but I signed up for promotional emails one time while looking at something or other I saw on YouTube - this time, the picture inside made me gasp out loud. Listen, you know I'm a sucker for lipstick, especially liquid lipstick, especially ESPECIALLY mauvey nudey browny Kylie Jenner-esque shades. So when this picture arrived, tell me what I was supposed to do (apart from remind myself that I own shades like these and I've only one mouth)? WHAT WAS I SUPPOSED TO DOOOOO? Sweet lipstick gods. I HAD to have them - or at least, two of them. When I logged on and saw the price (€19.95 each), the collector in me had to be silenced - I knew I wouldn't wear Hypno very often, so I bought Aries and Charmed. Shipping was €9.99 (beware - I'm not sure if that's standard shipping or if it depends on package weight) and I got to choose a free sample from a selection of small items - I chose a single eyeshadow from Makeup Revolution. The little card was a lovely touch, thanks Kimberly! Everything was well packed in bubble wrap. This is a charcoal eyeshadow that has copper and silver going through it. It's nice, I won't wear it that often, but I'd say it would work really well wet as a liner. Pigmentation was great but in general any Makeup Revolution eyeshadows I've used have been good. Note - I had to edit out a particularly gross spot on my face in these pictures. Seriously - if you think the hairy face is bad, you would have puked at the spot. Lip colours haven't been edited, photographs taken in natural daylight. Boozyshop stock a huge range of brands that may be music to the ears of fellow makeup addicts - as well as a huge range of Makeup Revolution products, you can get Milani, LA Splash, Morphe, and more on the site. I will be back! I'm not a big fan of Manny after some questionable behaviour a while ago, but these are gorgeous on you and sure it would be a sin (totally nearly wrote syn) not to check out the website wouldn't it?! They are STUNNING - I love Aries! Such a great shade. Some nice reviews on them. Ooh great buys, agree Aries is perfect for the summer and you'll get much more wear out of Charmed come Autumn!